You may have bought all the DLC, but you won't be able to play it anymore. In today's installment of "disturbing indications of future trends," virtual-rock-enthusiast website RockBandAide has reported that owners of the iOS Rock Band app will soon be out of luck when it comes to rocking on the go. Upon loading the app, an in-game message pops up (seen here to the right), informing users that the game will no longer function after the end of the month. The reason that we call this "disturbing," of course, is that the game will cease working for all users across the iOS platform - all of whom have (presumably) paid good money for the app as well as any extra song packs that caught their fancy. In fact, in the background of the message seen here, you can read that the extra song packs are still on sale, in case any players felt they hadn't thrown away enough of their money on something that would stop working within the month. As gaming moves closer to "service" models rather than "product" models, the question of how much of their purchase consumers really own is bound to become a hot topic before too long - if it isn't already. It's one thing for a company to shut down the multiplayer servers of an older game that doesn't have the playerbase to justify the expense anymore, but it's another thing entirely for, say, your copy of Skyrim to stop working because Gabe Newell goes crazy one day and shuts off Steam. 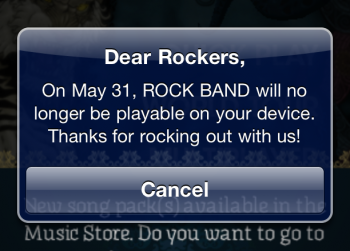 EA Mobile has not yet commented on the issue, and owners of the iOS sequel Rock Band Reloaded have not yet encountered any such messages. Some have suggested that this is an issue with Rock Band's music licenses - that rather than renew its licenses with record companies, EA has decided to just shut the game down instead. In this case, the more recent Reloaded could be up against a similar problem in one year's time. However, it could simply just be a matter of EA shutting down the older Rock Band in favor of the sleeker and more robust Reloaded - the way it shuts down older Madden multiplayer servers when people have moved on to the new hotness. Even in that case, though, EA has only ever shut down access to the online multiplayer, not the full game. Either way, it's kind of disturbing to think about.